I had spent the night camped in the Lake Hughes area. I had arrived there after dark and went about searching for the start of the Lake Hughes Truck Trail, a dirt road climbing up into the Liebre Range. The correct start is east of the lake, off a road signed as Private and confusingly so. Seems I didn't drive far enough up the road to find the truck trail and went about looking for another way. I found it at the end of E Lake Shore Dr on the south side of the lake. The pavement ends at a gate and it was here that I spent the night, expecting to walk the road in the morning. I was happy to find that the gate was unlocked and I was able to drive through the gate and meet up with the truck trail I had hoped to use the previous evening. I was able to drive almost 3mi up the road to get within a quarter mile of Peak 4,234ft. 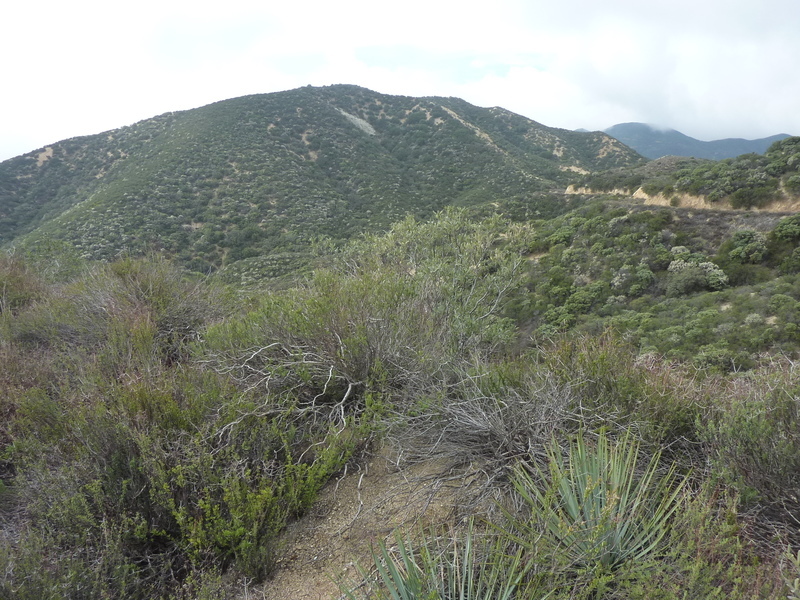 I parked at a saddle NNW of the summit and followed an old firebreak/motorcycle track up to the summit. Views were limited due to lingering clouds from the previous afternoon's modest storm system. I found a cairn and a small memorial someone had left for their family. The whole hike took only 10min, whereas the driving was 20min each way. Back out through the same gate, I spent the next 30min driving down Elizabeth Lake Canyon on Lake Hughes Rd, stopping at the closed Warm Springs Camp. I was here to hike the Warm Springs Fish Canyon Truck Trail to a trio of unnamed peaks. The truck trail is gated from the start and no longer open to vehicle traffic. I parked on the right side before the gate, one of the few places I didn't see No Trespassing or No Parking signs. The hike was long, about seven miles each way, including the small diversions from the truck trail to climb the various summits. I had the place to myself, not another soul the for the 5hr+ that I was there. Most of the gradient is pretty tame, no steep sections at all on the truck trail. Less than 10min from the gate, one finds out why the road has been closed to vehicles - a bad washout has completely destroyed it. It looks like the drains where Warm Springs Creek goes under the road got clogged, allowing the creek to run over the road and eventually modified its course to include part of the road. It would appear the Forest Service has no plans to ever reopen this to vehicles. Easy enough to manage on foot, however.